A look at why and how investors should look for profits in the growing global battery sector. The forecast for the global electric vehicle (EV) battery market is for it to grow at a compound annual growth rate of nearly 42 percent between 2017 and 2021, according to a recent Research and Markets report. A big factor in this rapid growth is the development of high-performance batteries, which are more efficient at storing and deploying energy. The report pegs Samsung SDI (KRX:006400), BYD Company (HKEX:1211), LG Chem (KRX:051915), A123 Systems and Panasonic (TSE:6752) amongst the key players in the space. However, Chinese battery giant Contemporary Amperex Technology Co. Ltd. (CATL) is maneuvering to become a more prominent player in the sector. It recently announced plans to raise nearly $2 billion via a June 2018 IPO, and then use the funds to build two battery plants to reach its target capacity of 50 GWh by 2020. Lithium and cobalt are two of the most important materials used in the manufacturing of today’s electric vehicle batteries. Both have seen impressive price growth in the past few years — especially cobalt, which now fetches more than $61,000 per tonne. Cobalt is under increasing supply pressure from EV battery market demand and ongoing turmoil in the Democratic Republic of Congo (DRC) — which accounts for 65 percent of global cobalt supply. The humanitarian crisis in the DRC has placed technology producers such as Apple (NASDAQ:AAPL), Microsoft (NASDAQ:MSFT) and Tesla (NASDAQ:TSLA) under increasing pressure to source their materials from conflict-free regions. Unfortunately, there are few alternative sources of supply outside of the DRC. The fact that cobalt is mined mainly as a by-product to other metals such as copper further complicates the picture. However, there are some junior companies with pure-play cobalt projects that offer promise, including Canada-based Global Energy Metals (TSXV:GEMC), which is building a portfolio of cobalt and other battery-material-related projects. The company owns the Millennium cobalt project in Australia, the Werner Lake cobalt project in Ontario, Canada and has a strategic partnership with Beijing Easpring Material Technology (SZSE:300073). GEMC recently entered into a joint venture partnership with Marquee Resources (ASX:MQR), which will provide funding and operational expertise to advance the project. To help investors gain further insight into unlocking the profit opportunities in the high-performance battery markets, the Investing News Network spoke with Dr. Wei Qian, founder and director of New Tigers Consulting. The China-based firm has successfully financed, advised, created partnerships and developed strategic plans for both international and Chinese companies looking to expand their business activities in the overseas markets. Investing News Network: What high-performance battery materials deserve the most investor attention? Dr. Wei Qian: Lithium seems to get most of the attention, but I believe cobalt poses more of an interesting angle for investors. Though there is an abundance of lithium today, it has been projected by some analysts that there needs to be an additional $10 billion spent to meet future demands. 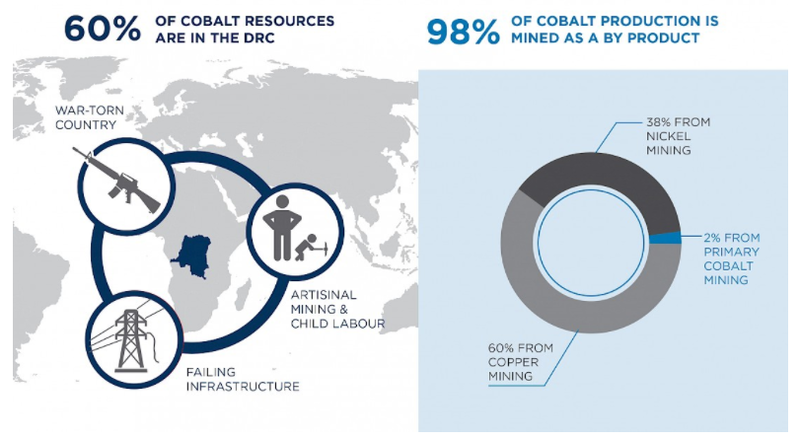 Cobalt is an even more intriguing proposition in that most of it is sourced from the DRC, a region rife with conflict and questionable mining practices. Further, roughly 98 percent of cobalt is produced as a by-product of copper and nickel production, which further complicates supply for downstream users that are looking for alternative sources free of conflict. INN: What is the price outlook cobalt in the medium to long term? WQ: With cobalt prices surging over the past year, hitting nine-year highs, there is continued optimism for the cobalt market and prices. All data suggests a looming supply shortfall, with estimates for cobalt demand increasing to levels never before seen coupled with the potential for serious supply constraints. Exposure to cobalt is something downstream users are keen to gain, and they are willing to pay for it now to secure supply. INN: How can investors gain exposure to the upside of increased demand for batteries and energy storage? WQ: Batteries and energy storage, driven for the most part by electric vehicles, is a huge investment opportunity. The good news is that it is very early in this game and there is still time to position oneself to benefit from this transformational super boom. I suggest that the best way for investors to gain exposure and profit from this boom is through the companies involved in extracting the materials that are critical to the chemistry of battery and energy storage technologies. By this I don’t mean just any company amassing land, but those that have documented resources and have partnerships with the downstream users involved in battery manufacturing. INN: What battery manufacturers are receiving the most investor attention in this space? WQ: Panasonic, through its partnership with Tesla and others, has probably received the most attention, but there are a multitude of others, including those in China like BYD and CATL. Samsung SDI is one of the leaders in batteries for small electronics and is also moving to dominate in energy storage and EVs. As some of the more traditional automakers like Ford (NYSE:F), Audi (ETR:NSU) and Volvo (STO:VOLV-B) gear to go electric, LG Chem’s partnership with these groups could lead them to become one of the largest EV battery suppliers in a few years. INN: Are ETFs a good option for investors looking to play this market? WQ: The Global Lithium X ETF (ARCA:LIT) has been very successful this year, but ETFs into other commodities in the battery space are limited. What investors need to remember is that rechargeable lithium-ion batteries on aren’t just made of lithium; there are a few other critical metals needed that have been overlooked until recently. My bet is on cobalt. Exposure to cobalt in particular usually involves large, multi-disciplined companies like Glencore (LSE:GLEN), whose focus is on the mine’s primary metals, like copper, and not on the cobalt by-product. Unfortunately, there aren’t any senior companies focused primarily on cobalt either, so investors need to look for exposure at the junior level. INN: What factors will help investors evaluate potential investments in mining stocks related to the battery sector? WQ: Focus on companies that have exposure to real projects with at least an established JORC or 43-101 resource that are located in business-friendly countries close to high-quality infrastructure. Also, ensure that the company has an understanding of the metallurgy. This is key and ensures that battery-grade material can be generated and thus sold to into the market. Speaking of downstream, having established partnerships in the downstream market and/or an offtake agreement is also very important and something a lot of companies don’t look at until much too late in the development of their business plan. This INNspired article is sponsored by Global Energy Metals (TSXV:GEMC). This article was written according to INN editorial standards to educate investors.